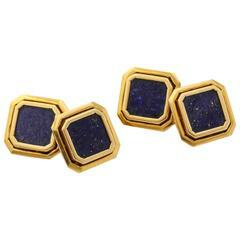 Antique lapis lazuli gold cufflinks circa 1900. 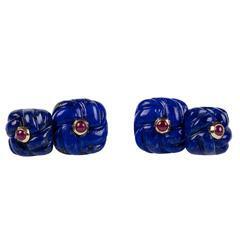 The matching, double sided designs feature oblong lapis lazuli cabochons mounted in 14-karat yellow gold. 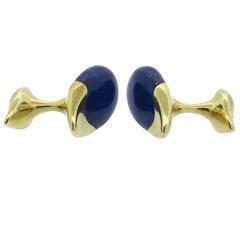 We love the understated, classical and masculine elegance of these lapis lazuli cufflinks. 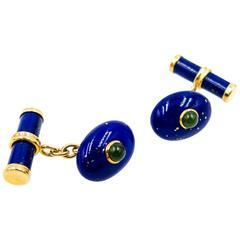 The color of good quality lapis lazuli makes for the perfect complement in men’s accessories. Very pristine condition consistent with age and wear. 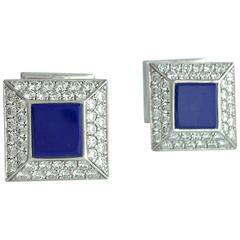 Celebrate Yourself and consider these elegant cufflinks as our very own personal treat to Yourself today. Make Yourself Happy. 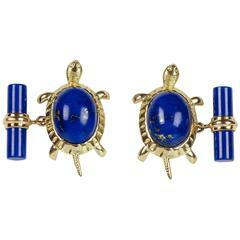 And if that won’t be the case, imagine just how Happy your will make that very special man in your life by gifting these classic and masculine lapis lazuli cufflinks as a token of your loving care and affection. Imagine the surprise, the joy itself, the pleasure they will bring. It will make you Happy too. Knowing that you have chosen with love in mind. 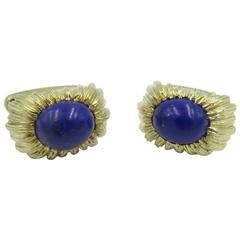 For over thirty-five years we have been in the business of making people Happy by selling a carefully curated collection of antique and estate jewelry. That is what it is all about, from our good taste to yours. Cheers! DIMENSIONS: faces approximately 5/8” by 5/16” overall. 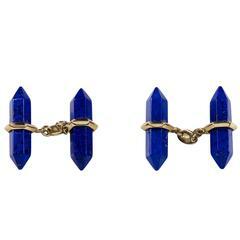 A pair 14k yellow gold cufflinks set with a lapis inlay. Each top measures 21mm x 13mm. Marked: 14k, 585. 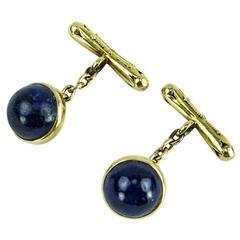 The weight of the cufflinks is 13.3 grams.